LATROBE, Pa. — Bob France. Mountain man. Lives in a log cabin with a stockade gate to keep the world at bay. Snares snakes for fun. The woods and its denizens are as familiar to him as the calluses on his hands. This stretch of the Allegheny Mountain foothills, running from West Virginia up through Westmoreland and Indiana Counties, is Pennsylvania‘s Twilight Zone. It was on Chestnut Ridge that France saw the creature he has come to think of as Bigfoot. And it was near a Chestnut Ridge hollow called Death Valley, he will tell you as matter-of-factly as if he were mentioning a bear or a deer, that he saw a UFO. “It was cigar-shaped, and it flew up and darted away in zigzags,” he said, showing a blurry photograph he took that night of the moon in a starless sky with a second, oval blaze of light in the photo’s corner. It would be easy to dismiss France’s stories if he were the only one to tell them. But over the years, hundreds of people have reported seeing similar eerie, even unearthly, things along Chestnut Ridge. To be sure, scattered reports of UFOs and Bigfoot come in from across the state. But the one place where reports have consistently accumulated is along Chestnut Ridge. And over the last 18 months, the number of sightings has been on the upswing. When so many of their friends and neighbors swear they have seen something, even skeptics hedge their bets. Stan Gordon. Electronics salesman. Runs the Pennsylvania Association for the Study of the Unexplained out of his Greensburg basement. Is listed in the 1988 edition of Who’s Who in UFOlogy. Has never personally seen a UFO or Bigfoot. “That hill over there is where Bigfoot was first seen, in 1972,” Gordon said one day recently, sitting in the coffee shop of Greensburg’s Sheraton hotel as he looked out a window across a shopping mall and pointed beyond the Sears store. “The people who lived there one night heard unusual animal screams. Then they heard something heavy walking. Someone saw lights coming in and hovering over a cemetery. Then the lights sped away. The next morning, one family found a large footprint in the dust. It had five toes and was larger than a human’s. According to reports Gordon has collected, witnesses consistently describe Bigfoot as a longhaired, foul-smelling creature six to eight feet tall that walks on two legs, has eyes that glow red in the dark and arms that hang down below its knees. If it makes any noise at all, witnesses have likened it to a baby crying or a bird chirping. Gordon says it is attracted to mobile homes and trailer parks. READ The Strangest Story Ever Told? UFO descriptions, however, have changed over the years. “In the ’40s and ’50s, most people reported saucers,” Gordon said. “Now they say they see cigar shapes and triangles. Gordon insists that the number of UFO and Bigfoot sightings has soared since August 1987. He said he has heard of at least 28 Bigfoot sightings throughout Pennsylvania in 1988 alone, and he has not even had time to tally the reported UFOs that cannot be immediately discounted by explainable phenomena such as meteors, aircraft lights and the like. Most were reported from seven counties clustered in southwestern Pennsylvania, and many occurred along Chestnut Ridge, but Gordon said he had not calculated exact figures. In any case, it still has not reached the level of 1973, when, Gordon said, Pennsylvania led the nation in UFO sightings and men in the towns around Chestnut Ridge formed armed vigilante posses to comb the woods at night looking for Bigfoot. Chestnut Ridge itself is a vaguely foreboding place. 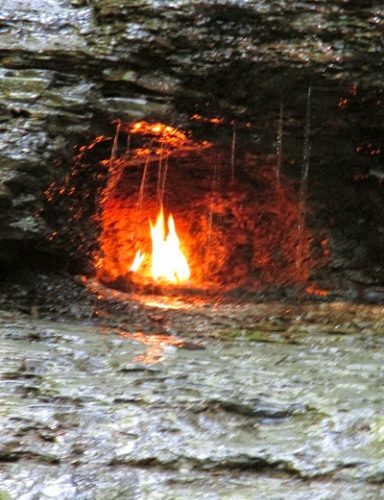 Two miles wide and about 100 miles long, the ridge rises 2,650 feet above sea level at its highest point, according to Robert Eppley, a physical chemist and spelunker who is a member of the Chestnut Ridge Explorers Association. On a clear day, the Pittsburgh skyline can be seen 40 miles to the west. More than 30 caves have been discovered in the low mountains covered with poplars and birch, and hikers from around Pennsylvania converge on Chestnut Ridge during weekends to descend into the underground mazes. Moss covers jutting plates of sandstone and limestone, lending an otherworldly air to hollows and dells with names like the Black Swamp and Dark Hollow. On each side of the ridge lay towns with names evocative of the immigrants who first settled them: North Florence, Bolivar, Kingston, Waterford, Derry, Latrobe, Youngstown, Bagley. Bill Dascani was living in a trailer home along the edge of the ridge in 1968, when he looked outside before retiring for the night and saw what to this day he insists was a flying saucer. Dascani’s ex-wife, Drucilla, who was with him at the time, confirms his account. Both remain haunted by the memory. Unlike Dascani, many people who say they have encountered Bigfoot or a UFO are ashamed to have their names publicized. They say they are belittled, and have their sobriety and sanity questioned. “I’ve been getting ridicule from my family, my friends and my neighbors,” said Bob, 28, the resident of a small trailer park outside Latrobe. It was Dec. 12 – the first day of doe season, Bob recalls – when he and his buddy, Bill, last ran across a tall, dark, hairy, smelly creature walking along a railroad track. He said it caught his attention by throwing something at him to stop his approach. He said he would have shot, but he sensed something vaguely human about it. Sam Sherry, who has hunted and fished for more than 50 of his 67 years, says he saw it, too, as he was unloading his car to go night fishing in Loyalhannah Creek alongside Chestnut Ridge. He said the creature, smelling musty like a wet dog that had been in an underground mine too long, approached him, beat its fist on its chest, then followed him to his pickup and put its hands on the hood so heavily that the truck sank into the mud. “Hey, biggie, cut it out, you’re gonna bust my tires,” Sherry said he yelled out, prompting the creature to let go with a wheeze and a grunt. Since that encounter, Sherry has become obsessed with the idea of trapping the creature, which he describes as having a body as shapeless as an old overcoat. He hopes to vindicate himself, and maybe even turn a little profit. So at night, Sherry goes into his back yard and looks toward Chestnut Ridge, as though he can somehow will the creature to come forward. “People won’t believe you when you tell them what you saw,” he said. ”They think you’re drunk. But I haven’t had a drink for 30 years. Bob France is looking for the creature, too, though he is armed with only a camera, and fruit for bait. Weekends, he ventures deep into the Ridge, hoping it will become familiar enough with his presence to come forward. Cal Smith, whose family owns 4,000 acres of the Ridge outside of Latrobe, has heard dozens of stories like France’s over the years. He remains skeptical.